The U.S. Air Force's robotic X-37B space plane sits on the Shuttle Landing Facility runway at NASA's Kennedy Space Center shortly after a May 7, 2017, landing that ended the 718-day OTV-4 mission. The United States Air Force's X-37B program is readying its next robotic mini-shuttle for launch, this time atop a SpaceX Falcon 9 rocket. The liftoff is scheduled to take place in early September, according to media reports. The upcoming X-37B mission — which is known as Orbital Test Vehicle-5 (OTV-5) — will lift off from Launch Complex 39A at NASA's Kennedy Space Center in Florida. The Air Force is known to own two reusable X-37B space planes, which were built by Boeing. The vehicles look like miniature versions of NASA’s now-retired space shuttle orbiter; each X-37B is 29 feet (8.8 meters) long and 9.6 feet (2.9 m) tall, and each has a wingspan of nearly 15 feet (4.6 m). The space drone has a payload bay about the size of a pickup truck bed that can be outfitted with a robotic arm. It has a launch weight of 11,000 lbs. (4,990 kilograms) and is powered on orbit by gallium- arsenide solar cells with lithium-ion batteries. 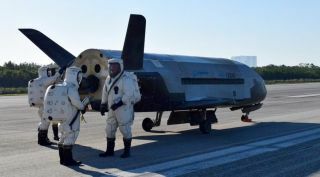 The X-37B program is managed by the Air Force Rapid Capabilities Office to perform risk reduction, experimentation and concept of operations development for reusable space vehicle technologies. The Air Force has flown four X-37B missions to date. All of them were launched by Atlas V rockets, which are built by United Launch Alliance — a joint venture of Lockheed Martin and Boeing. Each mission has established a new X-37B longevity record. OTV-1 lifted off on April 22, 2010, and concluded on Dec. 3, 2010, after 224 days in orbit. OTV-2 began March 5, 2011, and concluded on June 16, 2012, after 468 days on orbit. OTV-3 chalked up nearly 675 days in orbit, finally landing on Oct. 17, 2014. And OTV-4 conducted on-orbit experiments for 718 days during its mission, extending the total number of days spent in space for the X-37B program to 2,085 days. On May 7, 2017, OTV-4 landed at NASA's Kennedy Space Center Shuttle Landing Facility — a first for the program, as all previous missions had ended with a tarmac touchdown at Vandenberg Air Force Base in California. It's unclear what exactly the X-37B will be doing during OTV-5, or how long the mission will last. But, according to the Air Force, one onboard OTV-5 payload is the U.S. Air Force Research Laboratory’s Advanced Structurally Embedded Thermal Spreader, or ASETS-11. This instrument will test experimental electronics and oscillating heat pipes in the long-duration space environment.